So, yes I have been lagging with the blog posts and this is what I come up with? Yes, I know – weak. I have several things I want to share and one nice big fat blog post is the best way to do it. I will do this in date order and in list form. This is because people like lists! 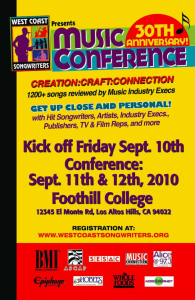 On September 11, 2010 I will be speaking at the West Coast Songwriters Conference in Los Altos, California. Founded in 1979, the WCS has grown into one of the most active music associations in the USA. Whether your goal is personal expression or to make a living in the music industry, knowing how to write, or recognize a well crafted song is key to your success. September 16, 2010 I will be speaking at the Social Media Strategies Summit in San Francisco. I will be speaking on “Creating a Solid, User – Friendly Blog to Increase Business”. Thought I would try something different and share what I have been reading, researching, working on, or just excited about. Since I have been lagging with my Facebook and Twitter posts. Of course I will do this in list form because people like lists! –Do Brands Belong on Twitter? Here is a very different take on the question. I don’t agree with all his points, especially banning them altogether. The author makes some great points though. –10 Tips For Getting New Twitter Followers His tips are excellent and right to the point. Its worth a read. –General Mills’ Pssst…is a Weak Stab at Branded Community GM gets a gold star for trying, but its a swing and a miss. Trying to build an online community is not as easy as it seems. Check out Paul’s review. –BlogWorld & New Media Expo Now One Super Huge Event! About time! This is a great move for both! This makes me fired up to go. Some of you may remember my review of New Media Expo , on my other blog. It got some interesting feedback. –SXSW is coming. Its one of the biggest and the best. Are you going? –Community 2.0 is a great conference coming up in May 2009 you may want to check out. I am thrilled to be part of it. Let me know if you like this Week In Review format. If so, I will do my best to keep doing it. It is always good to try something new!